The Lion King is one of those movies you just have to watch; it’s basically Hamlet with lions instead of pretentious English actors, which as an Englishman, I’m fairly certain scientifically makes The Lion King infinity percent better. Coming to America, however, is more of a cult film. It’s a good film don’t get us wrong, but its distinct lack of talking lions and giant talking clouds, which are also shaped like lions, doesn’t give it the same appeal. However, both films share a common thread, the King and Queen in each film are played by the same actors. 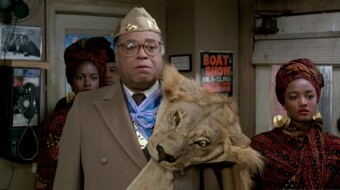 Yes, James Earl Jones and Madge Sinclair appear in both movies in virtually the exact same role, sans being anthropomorphic talking lions, though Jones does wear a Lion as you can see from the picture. The source for that comes directly from the, The Making Of The Lion King laserdisk, which along with being awesomely lasery, is watchable in the decidedly less-cool format of online streaming via YouTube. Of course, given Disney’s propensity to take down such things particularly after being mentioned on popular websites that brings it to their attention, it may be that the preceding link no longer works for you. Sorry about that. But we digress, we watched the video beforehand and Rafiki himself assured us that the voice actors for the film were chosen based on whether or not their voice could inspire the imaginations of the animators. As for other coincidences surrounding the films. James Earl Jones was the voice of Darth Vader before both Coming to America and The Lion King, so basically Jones has played both the worst and best fictional fathers in cinema. Further, on the set of Coming to America, Madge Sinclair stars alongside John Amos, who just so happened to play her husband in the acclaimed TV series, Roots. A TV series that went on to star, you guessed it, James Earl Jones. After they appeared together in Coming to America, but before The Lion King, Jones and Sinclair also appeared in the show, Gabriel’s Fire, in which they both won an Emmy. Seemingly they liked working together. In any event, we’re now wondering how we’d contact James Earl Jones about that Expendables idea we had. We think that could make a lot of money, and I think we can agree that we’d all love to have Barry White back. In the end, we’d settle for having Jones’ voice on our voicemail to replace our current message. Sinclair was the first female Star Fleet captain on Star Trek and Geordi La Forge’s mother. Geordi La Forge was of course played by the great LeVar Burton who also appeared in Roots and was nominated for an Emmy for Best Actor in a Drama Series for his role there. Burton would later go on to win 12 Emmy awards as the host of Reading Rainbow. He has also won a Grammy (for Best Spoken Word Album, reading The Autobiography of Martin Luther King, Jr.). He also has won a Peabody Award for his work on Reading Rainbow. How he didn’t win (nor was ever even nominated for) an Emmy for his role in Star Trek: The Next Generation is beyond us. During the production of The Lion King, they brought actual real lions into the studio for the animators to play with. If you’ve ever spent any time with lions, essentially they are over-sized domestic house cats in terms of much of their behavior. Jones has noted that he will say “Simba. You have deliberately disobeyed me!” to children who don’t believe he voiced Mufasa, to terrify and delight them in equal measure. Luckies. Coming to America is one of the first films in which Eddie Murphy plays more than one character. The success of the film led to it becoming a staple of Murphy’s movies. Yes, Coming to America is the reason we had Norbit. Let that sink in. How you gonna diss Coming to America? That is a great movie!